Hello everyone! Ever since @Whoaness retired from doing his Bet and Score Tracker we’ve all felt a void! So here I am answering the call, I don’t really do anything on Photoshop, though I've always wanted to learn..as of now, I cant promise any flashy graphics. This thread will be for tracking those sweet bets. I will appreciate if any of you guys submit past bets made, its location and any other bet that I didn’t picked up on (Maybe to prevent spoilers, podcast bets will be placed on Fridays.. FRIDAY?!). Ill be updating this post frequently. Bare with me, this is a working process and together we can get this working again. Thank you all! Bosman vs Huber - Will Far Cry 5 have a "Battle Royale mode" by the end of 2018? Bet: Huber bets that Far Cry 5 will have a "Battle Royale mode" by the end of 2018, Kyle disagrees. • Looser WILL BE HUNTED. The allies will go to a remote location and hunt down the looser with nerf guns. Results: Far Cry did not have a Battle Royale mode announced for 2018. Huber will be hunted down with nerf guns. Bosman/Ben vs Brandon/Ian - Will Metroid Prime 4 come out in 2018? Bet: Bosman & Ben believe that Metroid Prime 4 will come out before 2018, Brandon & Ian disagree. • Losers must write and perform a 2 minute duet about Samus Aran. Will the developer of A Hat in Time tweet @HatInTime something positive specifically about Super Mario Odyssey when it releases? Results: Ben looses and has to perform a 20 second original Buck Bumble rap. Bet: Kyle bets that Life is Strange 2 will have a new playable character. •	Bosman wins: Huber will dress up (cosplay) as the main character from Life is Strange 2 and post 5 pictures (selfies) on the EZA Twitter account during a 24 hour period. •	Huber wins: Bosman will dress up (cosplay) as the main character(s) from Life is Strange (first game) and post 5 pictures (selfies) on the EZA Twitter account during a 24 hour period. Results: DID IT HAVE A NEW PLAYABLE CHARACTER? Huber vs Jones - Animal Crossing NX will be a launch title. Bet: Huber bets that Animal Crossing NX will be a launch title. Brandon Jones disagrees it will be at launch. Stakes: The winner will name the loser's Animal Crossing Town. Results: Animal Crossing was not released as an NX launch title. Jones gets to name Huber’s next Animal Crossing Town. Bet: Huber bets that Titanfall 2 will be available on Black Friday for $40 or less. Ben says that there is no way that it will be on sale. Results: Ben did not dissapoint, he appeared in an actual Titan suit to the Personal Picks After The 2018 stream threatening the safety of all allies. Bosman vs Huber - Will Travis strikes again come out before Shenmue 3? Bet: Bosman bets that Travis Strikes Again will come out before Shenmue 3, Huber disagrees. • Bosman wins: Huber has to create design documents of an indie game. • Huber wins: Bosman has to stream Alien Isolation until he sees the Alien. Results: Huber created some designs for an awesome restaurant waiters indie game. Brandon vs Huber - Will GTA V come to Switch by the E3 2018? Bet: Huber bets that it will come out, Brandon disagrees. • Huber wins: Brandon has to watch Gotham Season 1 within a month. • Brandon wins: Huber has to watch 8 Will Ferrell comedies of Brandon's choosing. Results: Huber lost.. Jones sent us a picture of Huber watching the 8 Will Ferrell movies during the holidays. Bet: Huber bets that Sonic Forces will feature microtransactions revolving around loot, gear ect…. Bosman disagrees and bets that there will NOT be microtransactions. •	Huber wins: Bosman has to stream Phantom Dust for 2 hours (NOT ON DUMB GAME MONDAY). 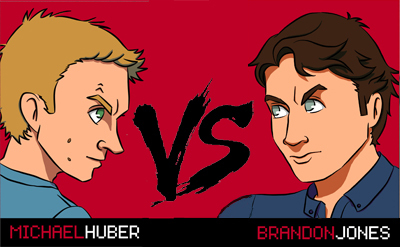 •	Bosman wins: Bosman will create Huber’s Sonic character and Huber has to stream with it in a 2-hour stream. Huber may name the character. Location: The Easy Allies Podcast #60. Results: Huber streamed Sonic Forces during easy living 2018. Bet: Huber bets that there will be some kind of Mini console collection similar to the Mini NES by the end of next year. Bosman bets that there will be none, that the Classic Mini NES was it. •	Huber wins: Bosman has to stream Captain Toad: Treasure Tracker for 20 minutes. •	Bosman wins: Huber has to write an email to the new Dodger announcer saying he appreciates the work he is doing "Sincerely Michael Huber"
Bet: Huber generously lets Blood pick if the time length talking about Xbox Scorpio's hardware specs will be longer or shorter than 9 minutes during the Microsoft's E3 Conference Presentation. Blood predicts that the spec talk will be shorter than 9 minutes. Results: Huber sang a beautiful Avant Garde song about the Xbox One X specs. Bosman vs Huber - Which will sell more between Destiny 2 and CoD WWII? Bet: Huber believes that Destiny 2 will sell more than CoD WWII. Bosman believes that CoD WWII will sell more. •	Bosman wins if COD WWII sells more and Huber has to wear a t-shirt live for a week that says "I just love pasta baby"
Results: COD WWII sold more copies than Destiny 2. Huber wore the beautiful shirt. I'm guessing you may just be using old title graphics, but "completed" seems odd to me when the stakes haven't been paid yet. Maybe needs a category in-between. @Bloodworth Yes, I am only using the "completed bets" because the graphic was available. As of now I only have below "Completed" the ones that are pending the payoff, like waiting on a release of a game or additional information... so there is a winner..but no.. they are not completed. @edsortiz I found it! thanks man. just a suggestion. I dont have photoshop skills so I wouldn't be able to make it look good if we did that. @supermaxio As long as it's being done it's OK. Bet: Kyle bets that Life is Strange 2 will have a new playable character (new character "who you play as"). If you can play as a new character, Bosman wins. Bosman wins: Huber will dress up (cosplay) as the main character from Life is Strange 2 and post 5 pictures (selfies) on the EZA Twitter account during a 24 hour period. Huber wins: Bosman will dress up (cosplay) as the main character(s) from Life is Strange (first game) and post 5 pictures (selfies) on the EZA Twitter account during a 24 hour period. @supermaxio The bet is if you will play as a new character. @ib0show oops, I misunderstood if they meant main character because of the what the stakes are. Fixed it. Thanks. @supermaxio just updated bet info. Earlier today I remembered a bet I made with Huber where if he loses, he has to write a letter to the new announcer for the Dodgers, but I cannot for the life of me remember what that bet was, or really any other details. Does anyone else remember that? @Bosman Maybe this is what's been haunting me in the back of my mind, wrote about that feeling to the old bet thread some time ago as well. I think this is already a few months old bet? Most likely from a podcast with Huber in it, possibly from a Tuesday group stream. Hopefully someone finds this. @Bosman I remember that it occurred but not when. If you check when the old announcer's last gig was perhaps that would be a clue? The bet would probably be the previous, current or following week. @edsortiz Well I remember the bet, so it has to be either the podcast or a group stream, since those are the two I watch. I think it was a podcast though. My memory of it doesn't include a lot of people.